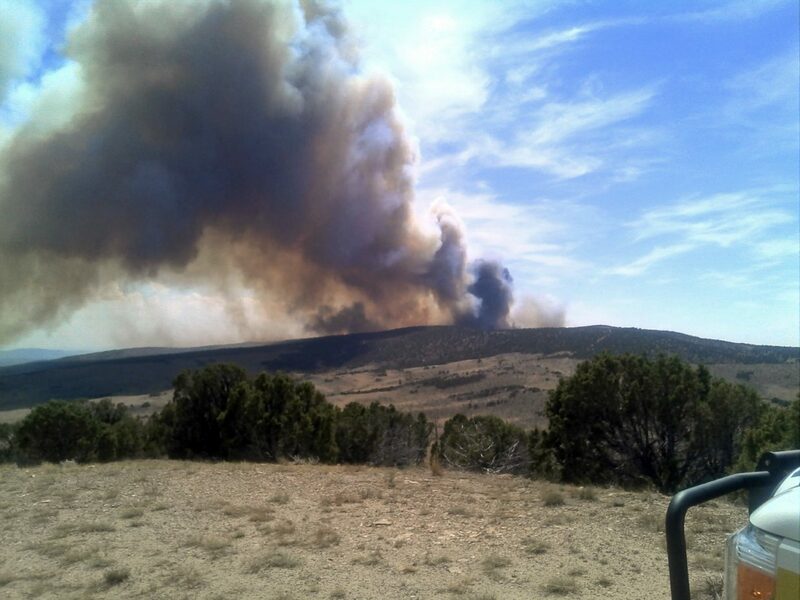 A view of the Wolf Fire, a 6,100-acre blaze actively burning in Moffat County about five miles south of Elk Springs. Steep, rugged terrain on the fire’s southern perimeter has slowed firefighting efforts. The Wolf Fire is reportedly 40-percent contained. Steep, rugged terrain on the Wolf Fire’s southern perimeter has proven difficult to navigate as the wildfire has grown to more than 6,100 acres, the Northwest Colorado Fire Management Unit reported Sunday. More than 200 county, state and federal personnel have been assigned to the Wolf Fire, burning five miles south of Elk Springs in Moffat County. Among the assigned resources are five 20-person hand crews, five engines, two Moffat County Road and Bridge Department road maintainers, two single engine air tankers and a helicopter, fire officials said. A type 3 incident management team also is in place. Though firefighters continue to make progress constructing fire lines on the Wolf Fire’s northern perimeter, the blaze has pushed into deep canyons creating an uneven southern perimeter. A helicopter has been assisting ground crews assigned to the southern perimeter by dropping water on hot spots difficult for firefighters to reach. The Wolf Fire is reportedly 40-percent contained with full containment estimated by Aug. 10. The Wolf Fire was ignited by a lightning strike Friday afternoon on Bureau of Land Management land and has burned on to private land. Gusty winds Friday made containment operations difficult and also resulted in smoke reports as far east as Steamboat Springs. Though the fire threatens oil and natural gas facilities three miles to the south, no injuries have been reported and no evacuation orders have been issued. The Divide Fire, estimated at 408 acres, is now fully contained, according to the fire management unit. The majority of the crews assigned to the Divide Fire are expected to be released today, while some fire personnel will remain to mop up and extinguish any remaining hot spots. The Divide Fire also was reported Friday afternoon and is located about five miles south of the Wolf Fire in Moffat County. Lightning also caused the Divide Fire. No structures were lost, but one injury has been reported, according to the fire management unit. Fire danger remains high in Moffat and Rio Blanco counties, and moderate in Routt, Jackson and Grand counties, the fire update states.